The Virginia Creeper Trail Welcome Center is located at the Abingdon trailhead of the Virginia Creeper National Recreation Trail. Operated by the Town of Abingdon, the Welcome Center is staffed Thursday through Sunday, April through November, and offers trail information as well as guides to Abingdon and the surrounding area. The Welcome Center is also home to a permanent exhibit of O. Winston Link photography and a fully restored steam engine called "Old Mollie." A Day on the Abingdon Branch: The Photography of O. Winston Link, 1955-1957. 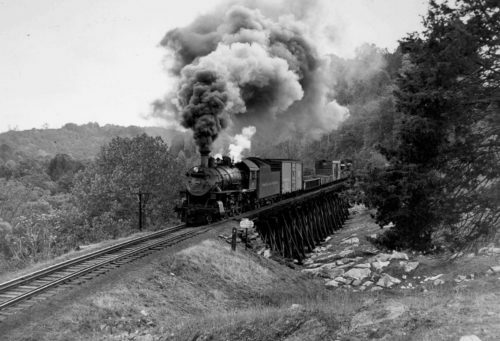 This rare collection captures the last steam train on the Virginia Creeper rail line. Exhibit courtesy of William King Museum of Art. Old Mollie Steam Engine – Norfolk & Western Steam Engine 433. In its heyday, 433 was one of more than 100 Class M engines owned and operated by Norfolk and Western during a 50-year period. Today, Abingdon’s Mollie is only one of two still in existence. 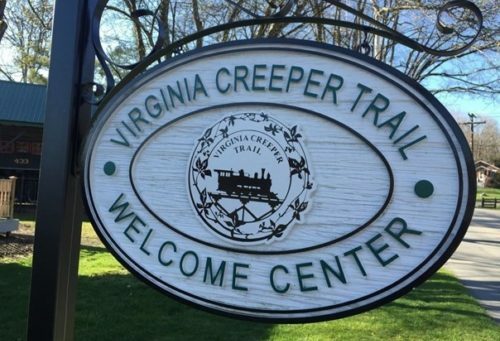 Official headquarters of The Virginia Creeper Trail Club, a 501(c)(3) nonprofit volunteer organization dedicated to the maintenance and preservation of the Creeper Trail corridor. Open 9am to 5pm, Thursday through Sunday. Open April through November. Closed December through March.